New Albany City Hall is located at 311 Hauss Square, New Albany IN 47150; phone: 812-948-5336. 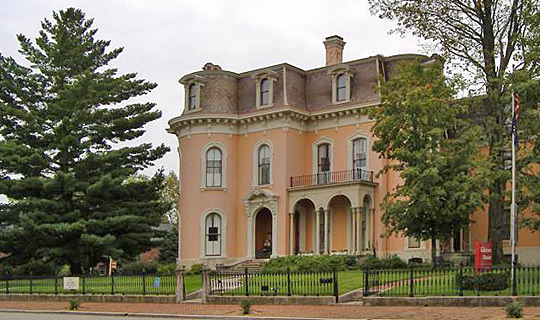 Photo: Culbertson Mansion, 914 East Main Street, New Albany, IN, National Register of Historic Places, photographed by Bedford, en.wikipedia.org, accessed March, 2011. New Albany is the county seat of Floyd County and was laid out in 1813 by Joel, Abner and Nathaniel Scribner along the north bank of the Ohio River. The original plat was a little over 800 acres. The land was purchased by the Scribner brothers from John Paul, who recorded it at the Government Land Office in Vincennes. The lots were disposed of by public auction on the first Tuesday and Wednesday of November, 1813, and there was a stipulation in the advertisement of the sale that "one-fourth part of each payment upon the lots shall be paid into the hands of trustees, to be chosen by the purchasers, until such payments shall amount to five thousand dollars, the interest of which to be applied to the use of schools in the town, for the use of its inhabitants forever." In 1814 a large number of families moved to New Albany and from that time forward the town enjoyed a steady and substantial growth. New Albany was incorporated as a city on July 4, 1839 with P. M. Dorsey serving as the first mayor. By 1850, the population of New Albany had grown to more than 8,100 persons. John M. Gresham & Company, Biographical and Historic Souvenir for the Counties of Clark, Crawford, Harrison, Floyd, Jefferson, Jennings, Scott and Washington, Indiana, Chicago Printing Company, Chicago, 1889.